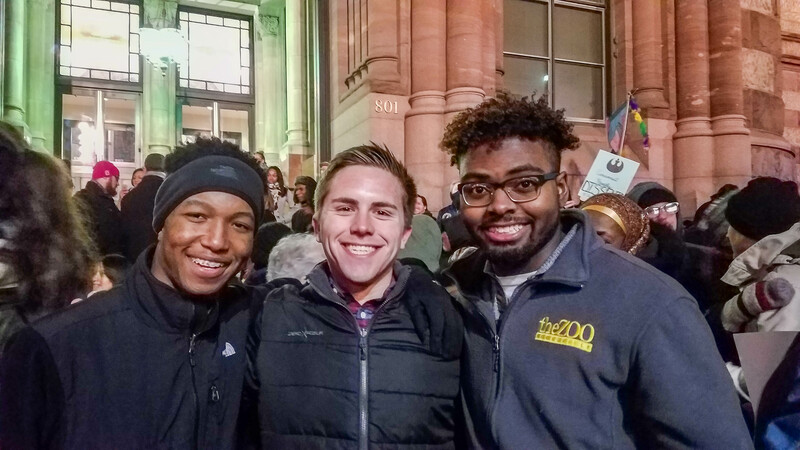 NKU student Sami Dada, Michael Bailey and Patrick Edwards attend Monday's rally in Cincinnati protesting President Donald Trump's executive order temporarily limiting immigration from certain countries. In light of the recent executive order limiting immigration in the United States, Sami Dada gave a moving and personal speech at the SGA meeting on Monday, January 30. Being an immigrant from Liberia, Dada made the short speech to persuade other SGA members to participate in the Rally for Refugees and Muslims that took place at 5 p.m. that same day at Cincinnati City Hall. Over 5 SGA members attended the rally after the meeting was adjourned, accompanying Dada to offer support for refugees and Muslims. In addition to Dada’s speech, the Veterans Resource Center Liaison, Alex Foland, asked SGA for help in getting the word out about Warm Our Hearts, a campaign dedicated to helping homeless veterans. The campaign is aimed towards providing homeless veterans from the Ft. Thomas VA with gloves, hats, scarves, canned goods and hygiene products. to “warm their hearts” during the month of February. Donations will be accepted at the Veterans Resource Center located in UC 131.